Following the version 1.04 update for Call of Duty: Advanced Warfare on the Xbox One and PlayStation 4, it's become much tougher to determine which platform presents a better version of the game. 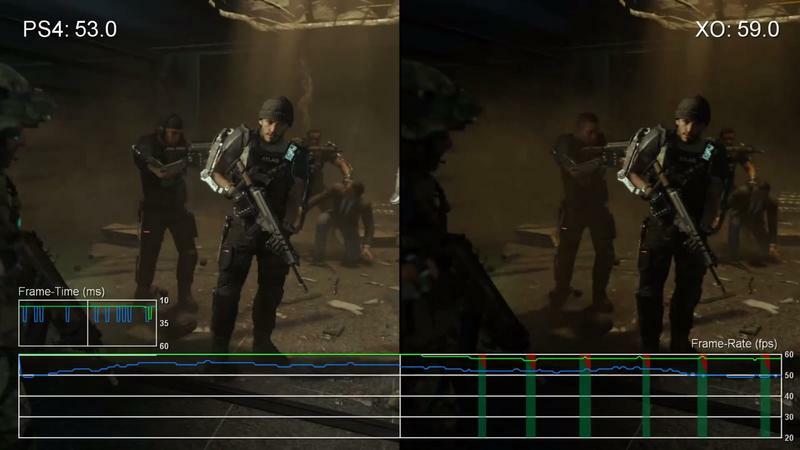 The Xbox One's resolution is upscaled to 1080p when the screen isn't taken up with effects, while the PlayStation 4's sits at a constant 1080p throughout. As Digital Foundry has it after the aforementioned 1.04 version update, the PlayStation 4's 1080p resolution means a framerate no longer locked at 60fps. The video at the head of the post shows the two versions in action with a framerate graph along the bottom. The Xbox One's rate is green, while the PlayStation 4's is blue. You'll see both flutter around the 60 mark, but it's the PlayStation 4's framerate that falls below 50 a few times. Now sure, the game plays well on both machines, there's no doubt about that. But here we have an example of the choices developers need to make in order to satisfy gamer demands for things like resolutions and framerates. The PlayStation 4 can obviously handle 1080p, but that comes at the expense of a constant framerate. The Xbox One version can give you the constant 60fps you want, but that comes with the price of non-native 1080p. If you care about these things, the choice is yours. Of course, a new patch might bring the PS4 version to 1080p locked at 60fps, but right now the two are split.